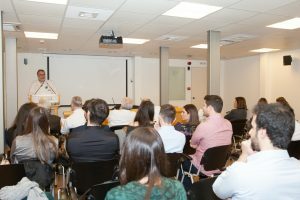 A ceremony marking the end of the latest HYGEIA Andreas Vgenopoulos Postgraduate Internship Program for the internal medicine and surgery clinics was held at HYGEIA Hospital on Friday January 12, 2018. HYGEIA funds this 4-month program, organized by the Scientific Union of HYGEIA Doctors. The Postgraduate Internship Program caters for young doctors who wish to specialize in internal medicine and surgery, and want to work as hospital physicians. Attendance certificates were conferred to 13 postgraduate physicians during the special event. Mr Platonas Rivellis, photography expert, delivered a speech on “Why a Doctor Needs to Photograph”. The event was also attended by Mr A. Kartapanis, CEO; Mr G. Zacharopoulos, Scientific Board Chairman; Mr S. Papadopoulos, Medical Services Director; Mr K. Iliadis, Educational Committee Chairman; and Mr V. Prasopoulos, Chairman of the Scientific Union of HYGEIA Doctors.